We started beekeeping a couple years ago. At that time we had no idea what keeping bees was about. Loving honey and wanting pollination for our garden was a driving force. 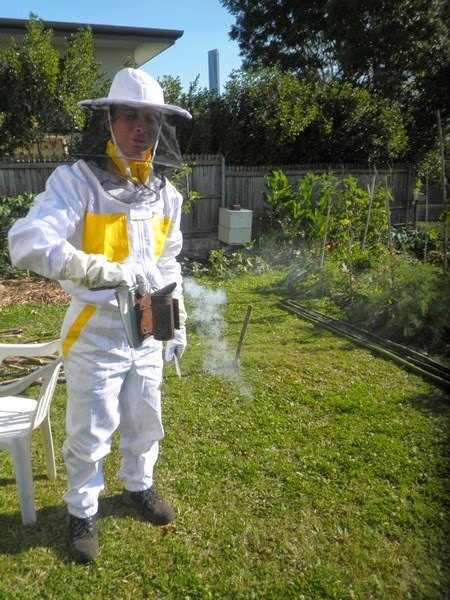 We read a book (The Bee Book – beekeeping in Australia, by P. Warhurst) and visited a local beekeeping club to find out more. We also asked all of our neighbors if they were happy for us to have bees in our back yard. 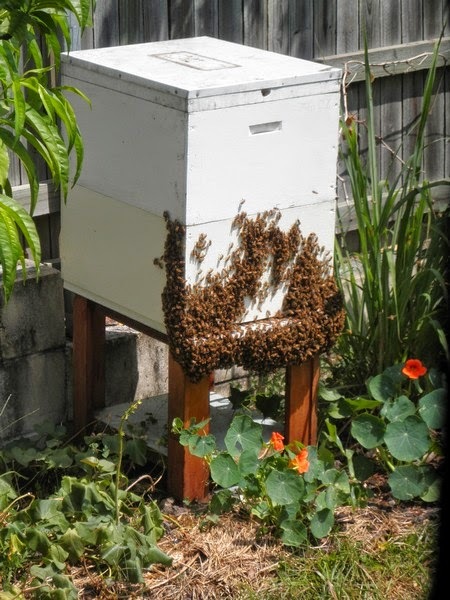 When we had gained sufficient initial knowledge and ‘yes’ from our neighbours, we looked at local council requirements (up to two beehives in a suburban backyard) and registration requirements of the DPI. 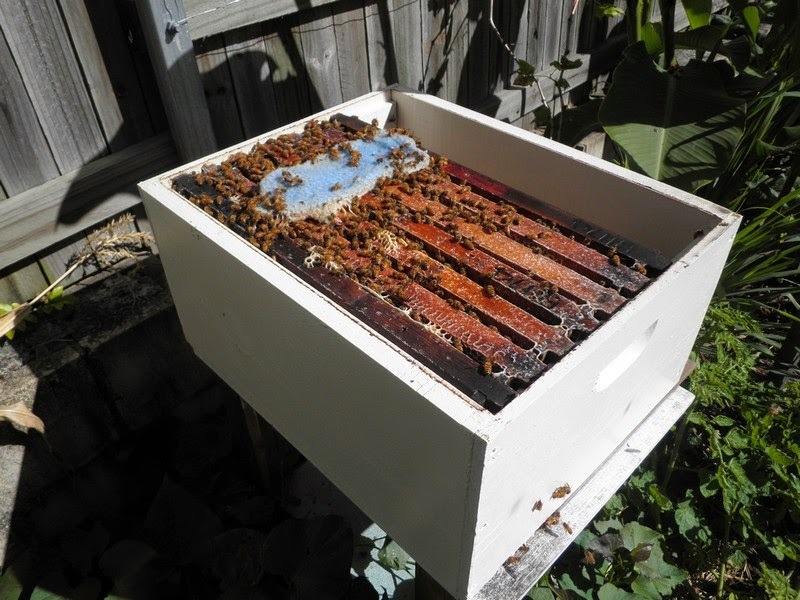 (annual fee of about $15, which was not a problem at all) We got a nucleus hive (four frames of honey bees with a queen for $70) from a local beekeeper at a beekeeping club. 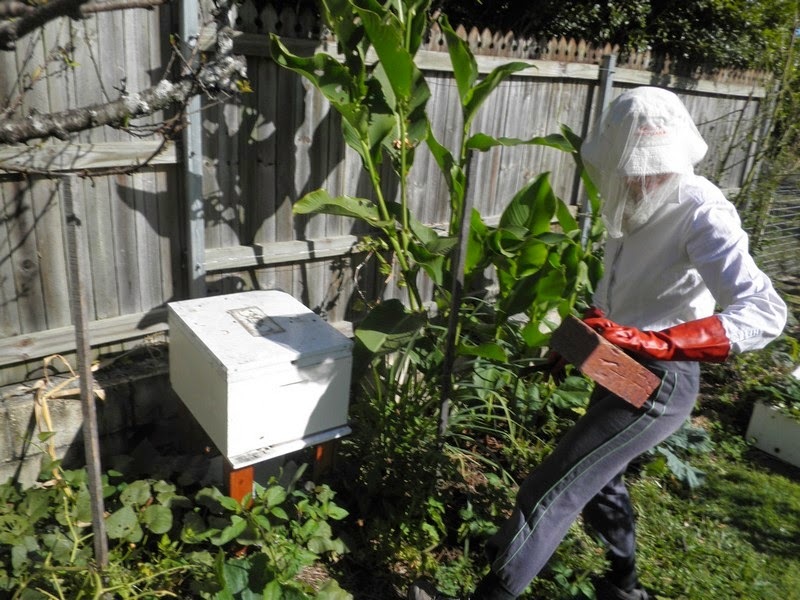 That autumn day we brought bees into our backyard gave us great joy and excitement. After a few days of familiarization with their new environment, we transferred the frames from the nucleus box into the bottom beehive box. 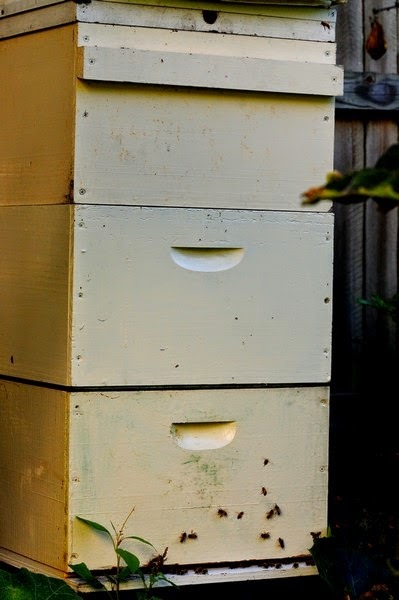 The bees established themselves well over winter time and were at full strength in spring time when we added an extra box for storing honey (super). These two boxes are separated with a queen excluder (a wired frame) which keeps the queen in the bottom box while allowing bees to get through to the upper boxes to store honey. It has been great fun watching them flying out and bringing back different coloured pollen on their legs. Watching young bees hovering in front of the hive learning to fly and recognizing the area, is on schedule daily at about 2pm (you can set a watch by them). Managing the hive is not difficult. We got second hand equipment from friendly beekeepers so the only things we bought were the nucleus hive, veil and gloves. It cost us around $100 to start. 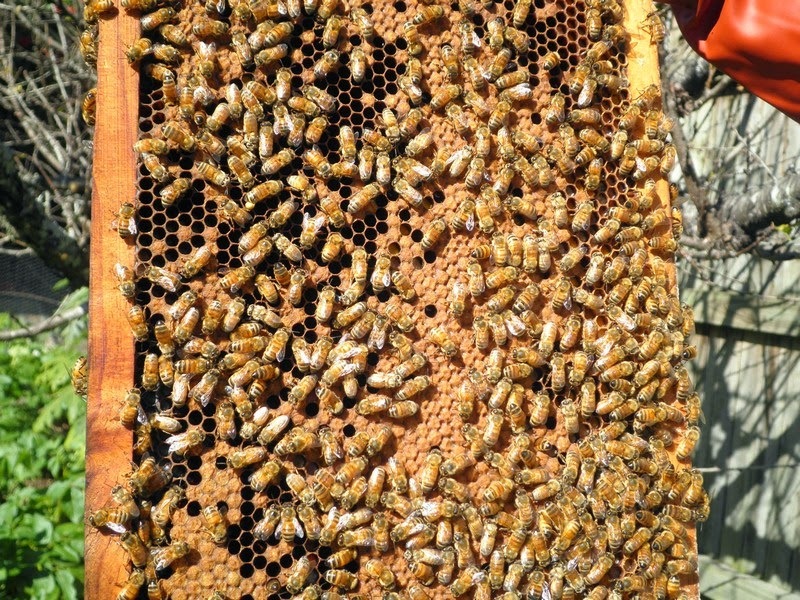 In spring they became very busy with making honey. 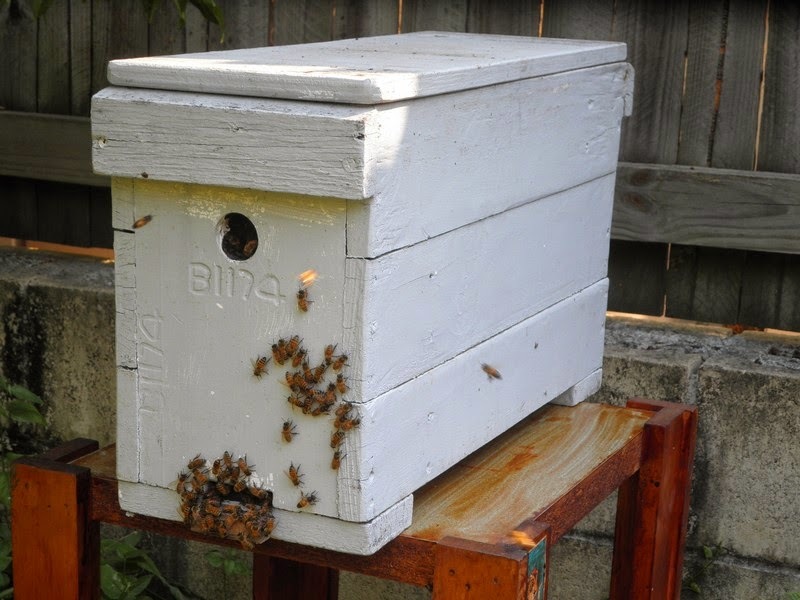 We added an extra two boxes (supers) for storing honey on top of the bottom (brood) box. 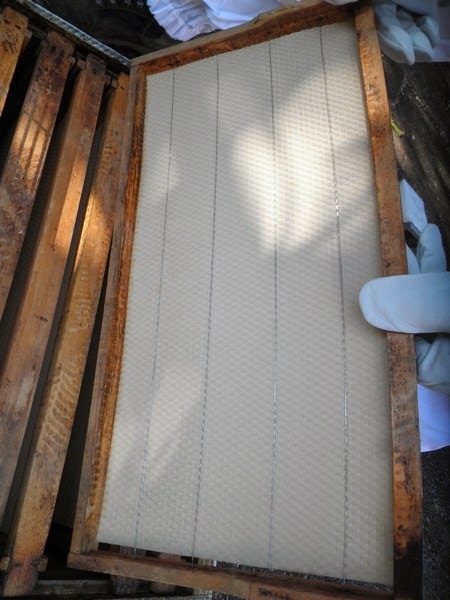 In fact from spring till late summer we harvested honey six times and managed to get an unbelievable 160kg of honey from one hive. To extract honey we borrowed extraction equipment for free from our beekeeping club of which we have become members or through our beekeeper friends. It was incredibly joyous to extract and taste our first batch of honey. The honey is real raw honey, incredibly tasty, thick and delicious as it comes from huge variety of flowers in suburbia. Once you try "proper" raw honey you would not buy honey from a shop. Honey from a shop has most likely been thermally treated to make the honey flow during processing and this also kills all the good enzymes. 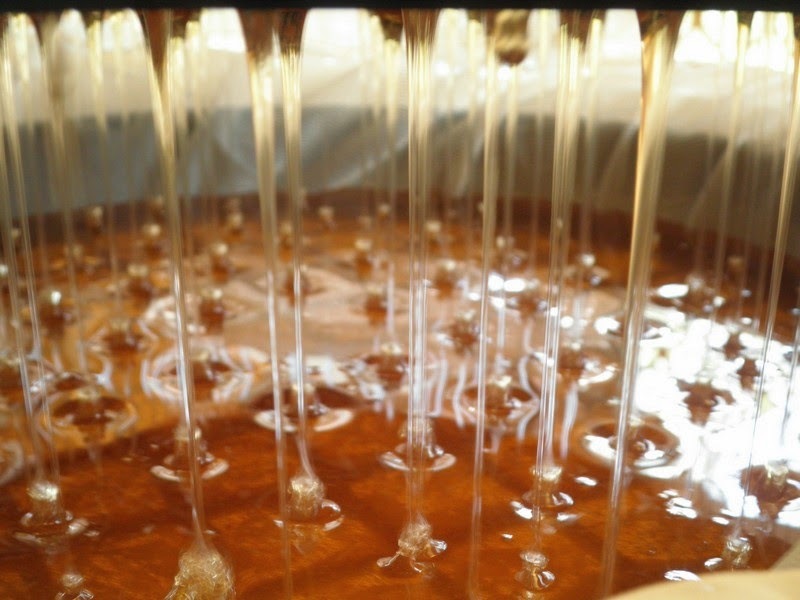 It is also treated to stop crystallization which is a natural reaction of honey to cold, and has additives put into it. When using honey to sweeten tea or coffee put it into a cup just before you drink it. That way, it is not super-hot and does not burn live enzymes in the honey. Pollination for our back yard garden and also the entire neighbourhood. Honey as a replacement for sugar. Pollen - a great source of protein, minerals and trace elements. It is five times more concentrated protein than beef. Propolis which is great as a disinfectant and for tooth and gum issues. Wax for candles and polishing paint. A bee hive is the most efficient system in the garden. Bees are so hard working and such well organized creatures – if only human beings could be like that. Did you know that the queen can lay up to 2000 eggs a day which is more than her body weight. When bees collectively decide that the old queen is no good any more, they will make a new one. One bee will produce in its life which is around 6 weeks, about one teaspoon of honey. 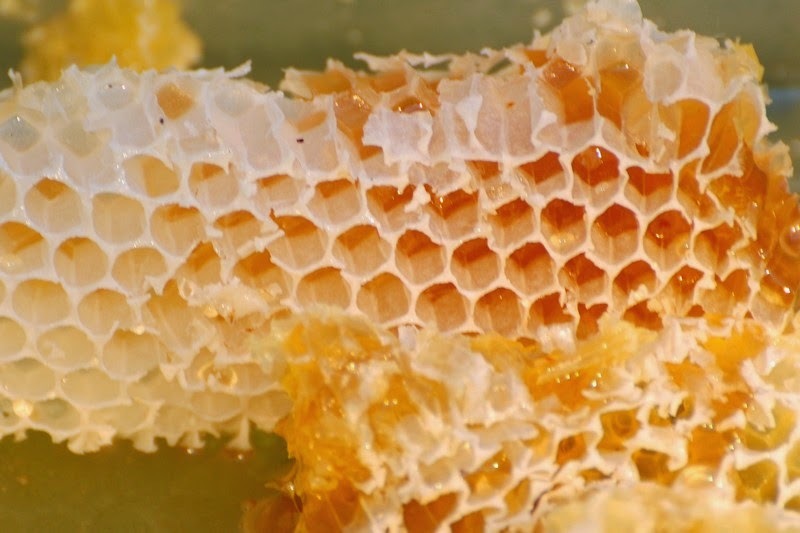 You can harvest up to 500g of pollen from one hive a day. 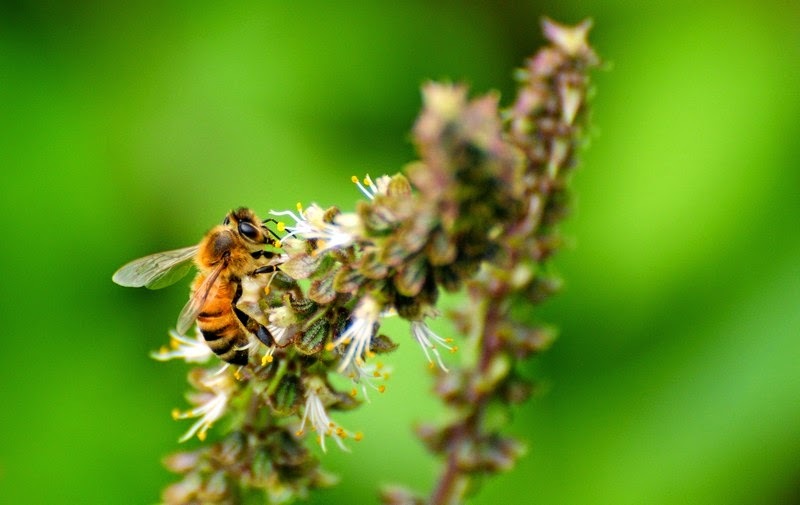 Without bees we would not have over 90 % of our commercial crops – our entire food supply depends on bee pollination. A great post. I bet your neighbours appreciate the improvement with pollination of their veggies! Great post! I just learned so much about the humble bee. Thank you for your generosity in sharing your knowledge, we are now going to investigate further and maybe give bee keeping a go.